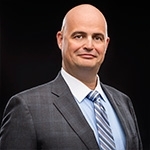 Since assuming the role of CEO at SDI in 2016, Chris Moore has led the company in transforming MRO and indirect supply chain management from a cost of doing business to an enabler of great business. An advocate for industry change, Chris is a dynamic and insightful leader with a history in manufacturing and a strong focus on integrated and outsourced business environments. Chris leads his team to tackle problems head-on and implement lasting solutions that effectively and efficiently improve customer and employee satisfaction as well as bring additional profit to the bottom line. A Six Sigma trained professional, he has been the prime mover in the creation of SDI’s MRO Technical Services offering and the deployment of Lean and Six Sigma principles throughout the company. Under Chris Moore’s leadership, SDI was recognized on the SpendMatters 50 Providers to Watch 2016 list and is an active corporate sponsor of Penn State’s Center for Supply Chain Research, partnering with the CSCR on several research studies and industry events. Prior to joining SDI, Chris spent over 20 years in the integrated supply industry. Chris Moore received his BS in Aviation Technology from the United States Air Force. A trusted industry expert, Chris has been interviewed for industry podcasts with Beroe and MRO Guy. He also publishes a monthly LinkedIn series, Partner Perspective, in which he highlights the different perspectives within the Manufacturing and Supply Chain industry. Chris brings a supplier and manufacturer perspective to the supply chain ecosystem and his holistic approach at SDI.